If your a Californian that likes the idea of hiking and biking around some of the beautiful parts of our lovely state - but doesn't quite know where to begin - you're going to like Weekend Sherpa as much as I do. You can sign up to get a different weekend adventure idea emailed to you every week. From riding the Crystal Springs Regional Trail around Crystal Springs Reservoir to staying the weekend at the Mar Vista Cottages on the beautiful Mendocino coast, something will be your style. For me, it always helps when sites like this are well designed - and this one is. I love the look and feel. 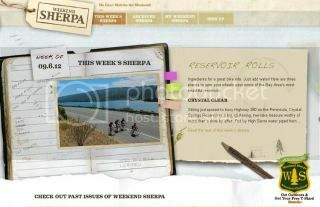 If you're the type of person that likes a challenge (and free stuff) - check out the Weekend Sherpa Adventure Challenge. Let me know what you think! And let me know if you want to try one of the adventures with me! I would like to try one of the adventures with you.